Liquidating business equipment means getting back some of the capital that you invested into your wares. Sometimes, businesses liquidate their stock because the equipment is no longer relevant, and upgrades are needed. Other times, liquidation is needed to produce quick cash to satisfy creditors. An unfortunate reality of business ownership is that very often the business must close down. There’s a lot of talk and information on starting your own business. There are innumerable guides on how to make a stake as an entrepreneur. There are government incentives for people to start businesses, and the “be your own boss” lifestyle is glorified throughout business circles. The termination of a business and liquidating its assets is a sobering look at the other side of the entrepreneur cycle. No matter the reason for liquidating your business assets, it’s important to choose the best professional liquidator possible. It will be well worth their fees to get a better return on your business assets, and handle all transactions in a smooth, professional manner. Professional liquidators have seen the end days of a business many times, and can be a refreshing guide on how to navigate the process. There is no excuse for a business to have a poor online presence in 2019, whether or not the business is in the technology industry. The way a business curates their online presence shows they’re active, and on the level of their customers. A business can show its expertise and trustworthiness with a carefully crafted online persona. Take a look at any professional liquidator’s website, their Google reviews, their customer testimonials, and any social media they might have. If something strikes you as strange in their online presence, it may be an indication there is a lack of oversight in the company. Checking out a business’s online presence is a good way to establish a gut feeling about whether or not to move forward. What Resources do They Provide Potential Customers? Businesses need to provide something of value to potential customers, whether or not those people actually become paying customers. A business equipment liquidator should have blog posts outlining industry practices, whitepapers on their areas of expertise, and/or email newsletters to keep their clients in the loop. A liquidator should not be afraid of sharing general information with prospective clients. The aim is to assist people looking to liquidate their assets in an open, transparent manner. What Type of Strategies do They Offer? 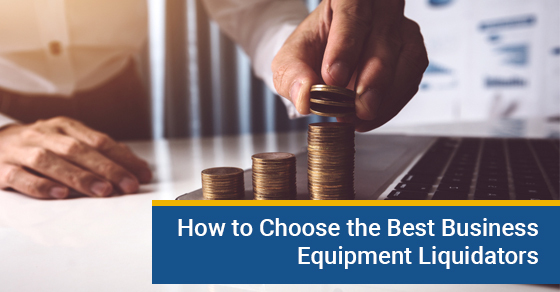 There are ways to make the most revenue from equipment liquidation. A professional liquidator will formulate a customized plan for your business, given your industry and the condition of your equipment. The first step is to itemize, photograph, and label your equipment. This will help you take stock of everything you have, and gives you a body of proof should you be asked to explain your liquidation to creditors or the Canada Revenue Agency (CRA). You’ll be much more organized about your efforts by first establishing a complete and detailed list of what’s in your possession. The next step is to decide what items to sell and what to donate. If any of your items are in significantly worse condition than the majority of your stock, donate them to receive a tax credit. This will boost the perceived value of your remaining equipment. Afterward, analyze your leases on any large items you may have. If the lease is near completion, it’s a good idea to actually pay it off so you can own that item. That way, you can sell it for a few thousand dollars and recoup a good portion of your investment. Take stock of your business assets, such as in-demand licenses, property leases, permits, patents, and customer lists. These may be extremely valuable to other businesses. Marketing your customer lists is a very effective way to generate extra capital; such lists are in hot demand in some industries. Finally, establish the liquidated value. A professional appraiser will consider all aspects of your liquidation and derive a sum total of your assets’ value. This will give you a solid basis with which to approach the market and sell off your items. Your appraiser will also help you choose the best type of sale to liquidate your items; there are many types of sales, such as negotiated or internet sales. Liquidating assets is not the most enjoyable part of the business cycle, especially if it’s due to the business shuttering. Working with professional liquidators who are active, abreast of modern market conditions, and who truly possess a desire to help their clients can help immensely. You can take a negative situation and turn it into a positive, getting the best possible return for your investments and setting you up for a positive financial future. Michael’s Global Trading performs business asset appraisals for a broad spectrum of industries. For more information, call us at (888) 471-5066 or receive a quote here.